As local government changes and merges together for good and for bad reasons our most significant local council neighbour to Sefton, with which we share a massive boundary, is in danger of becoming the area that has no partners and potentially an isolated future. Sounds harsh I know but I have already posted on this site about my great concerns regarding the ‘merger’ of all 5 of the Merseyside local authorities plus Halton (Widnes and Runcorn) into what one could call a new Merseyside County Council. This has been all but a done deal (and a bad done deal for Sefton at that) with only Sefton’s Labour run Council yet to sign up until tonight when, with Tory support, Labour did so. That deal is bad geographically because it does not include West Lancashire and places like Ellesmere Port and Neston and maybe even West Cheshire which are all in the travel to work area of Liverpool. 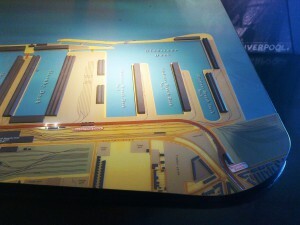 Merseyside as it will be constructed is too small to be an effective sub-regional or city region area. But take another angle on this because Preston City Council and South Ribble Council and Lancashire County Council have also signed up to a partnership deal. What’s more the hugely effective grouping of Councils surrounding Manchester (including Wigan) has probably got the best partnership deal of all. None of these deals includes West Lancashire which is now all but surrounded by groupings of councils that are closely working together. This has to put West Lancs at a disadvantage. What future West Lancashire Borough Council………………………..
Sheila, Jen and I went to a fascinating talk by Sharon Brown the Curator of Land Transport at Liverpool Museum last Saturday. Here are three photos. 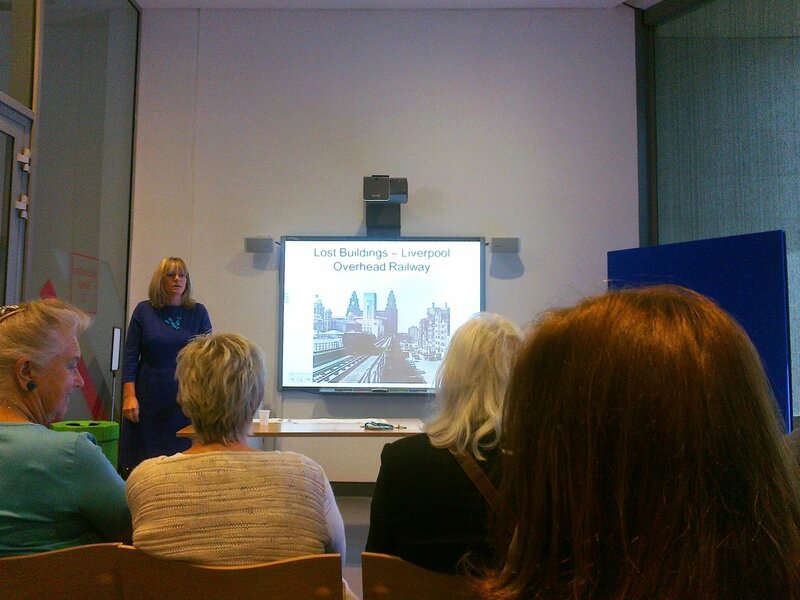 The first is of the talk from Sharon (seen in the blue dress), the second is of the tunnel mouth where the Overhead Railway actually used to go underground at the south end of the line approaching Dingle Station, the third is a part of the model of the railway in the Museum of Liverpool. 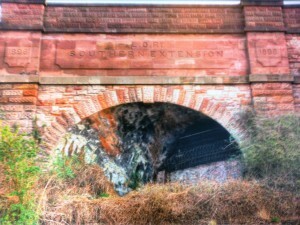 Sharon clearly knew her subject and put it over well with a number of slides showing the building of the line in the late 1800’s right through to its closure in 1956. Some in the audience were old enough to recall travelling on the Overhead, locally known as the Dockers Umbrella. The talk was part of Heritage Month. 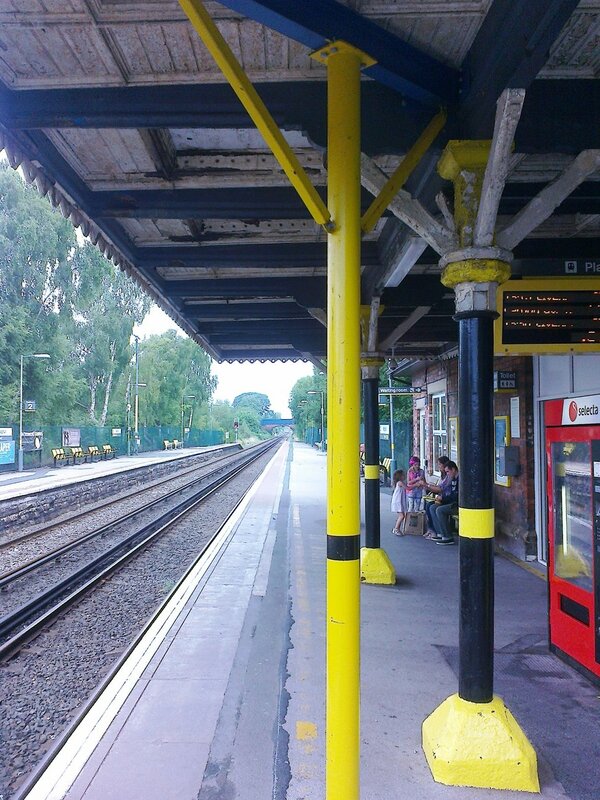 Maghull North Railway Station – The proposed new station gets in Merseytravel’s top twelve (at number 10) of projects it wants to take forward – But what does that mean? I have long campaigned for a second railway station to be built in Maghull because the present station is getting beyond capacity. It is accessed by narrow roads and its car park is usually full to bursting. A new station to the north of Maghull would open up much wider and more convenient travel opportunities. In reality the project has been talked about for many many, years but it never got to a ‘let’s do it stage’ until the worst possible time i.e. when the latest financial recession knocked us all for 6 from 2007 onwards. It is still the case that part funding of the station will be via a developer contribution from building on the Ashworth South Site which the proposed station will share. This site is also known as that of the former Moss Side Hospital which has remained derelict ever since it was decided not to build a new prison there. So where are we now? I have been asking questions of Merseytravel every few months via my good friend Cllr. John Dodd who sits on Merseyside’s Integrated Transport Authority but the answers have always been negative in that money is the barrier. However, some almost good news is that the project is firmly in Merseytravel’s top twelve of projects that it wants to take forward bearing in mind very limited resources. Does this mean it will happen? Well, I suppose you could say that it remains aspirational rather than a ‘yes it will’. So will we see this new station really take shape soonish? Well a number of factors come into play here. Firstly, will the development of the Ashworth South site for housing come on stream soon providing a financial contribution from the developer towards the project? Secondly, will the new Joint Authority proposal which effectively sees off Merseytravel as an independent transport body (and all but brings back Merseyside County Council) lead to the money being snatched to fund a Liverpool based project instead? This has to be a big worry and is one of the reasons we Lib Dems in Sefton are very much opposed to the Joint Authority with its potential for a Liverpool-centric money hoover that could leave Sefton with little more than crumbs from the table. Keep campaigning is the only way forward to my mind because one day we may just succeed in getting Maghull’s second and much needed railway station. My thanks to colleagues at OPSTA for providing some of the information I have used in this posting. I took this photo a couple of weeks ago and it is clearly the case that this historic canopy over the Liverpool bound platform must have been in danger of collapsing based on the temporary prop that has been put in place. I am pursuing this via Merseytravel/Merseyrail and very much hope that permanent repairs will be made. We don’t want to see a modern canopy replacing this excellent Victorian one that Frank Hornby himself must have stood under. 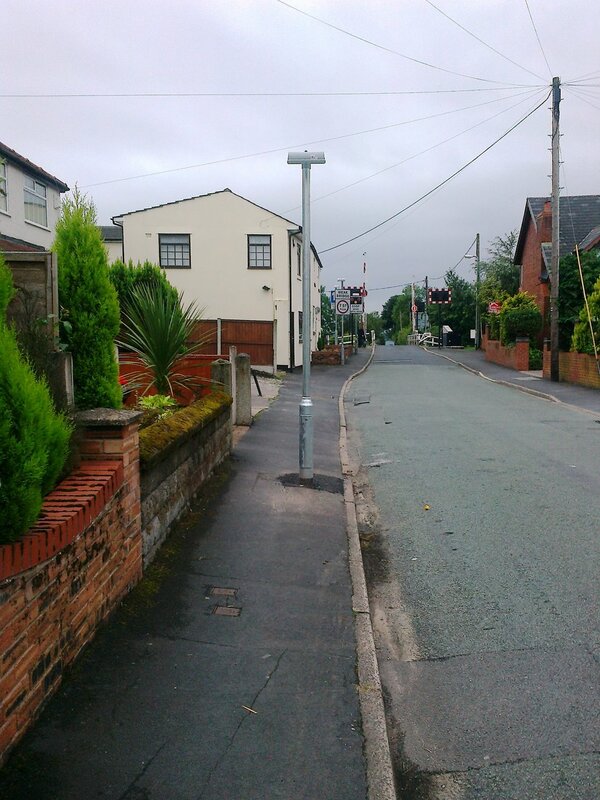 Bells Lane, Lydiate – 12 months to renew a road sign! 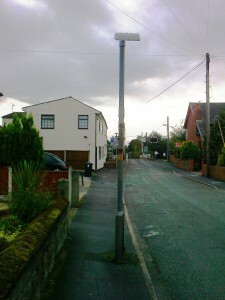 I reported this illuminated and down at heel road sign pole for replacement in September 2012. September 2013 – A new pole finally appears! 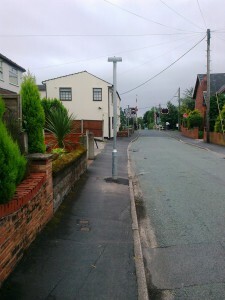 I was despairing of this pole ever being replaced, but he who waits (a long time) etc. etc. It is supposed to be a warning sign for approaching motorists of the canal swing bridge which you can see in the background. First the old illuminated pole lost its sign (to a scrap metal thief?) and then the pole, which was hardly looking well looked like it was about to become a hazard itself rather than warning of one. In September last year I asked Sefton Council to replace it and we are finally almost there in that the new pole is in with just the warning sign to go on it. You don’t have to be in a hurry in Sefton it seems!